“I’ve been here 27 years,” she said. We exchanged names. She was polite, but she didn’t take my question as the bait I intended it to be, that is, an invitation into friendly conversation. I sensed that she had no interest in me, or probably more accurately, that she was extremely private. She looked about my age, somewhere between 55 and 75. I got it. This woman truly sought solitude; it was her MO and she didn’t need contact with strangers like me. I laughed and backed away from my social inclinations. She smiled a gentle Buddha smile; I went back inside. I’ve been to Crestone before to visit good friends who built a home on the Baca, but I stayed for only for a day or two. Now I’m completing two-and-a-half weeks of house-sitting in a ochre/orange Santa-Fe-style home with a view of the mountains out the back windows and the open stretch of the plains out the front. It’s extraordinary. To get to this unique spot, you drive about four hours south from Denver (or north from Santa Fe) into the high desert in the center of the San Luis Valley. Off to the east are 14,000-ft. snow-capped peaks of the Sangre de Cristo range, shockingly white if you catch them on a clear day when the sun pours through the happy clouds. If you were a bird, you could wing your way east over the range and soon be in Pueblo, Colorado. To the west of the sandy plain on which Crestone sits are the Rockies. To the south of town is the mind-boggling Great Sand Dunes and its Natural Park and Preserve. It’s all on the fringe of the Rio Grande National Forest. This is Saguache County (FYI, pronounced sa-WATCH). It’s desert-plains beautiful. 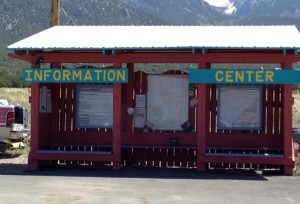 But pay attention to your driving if you’re headed for Crestone. 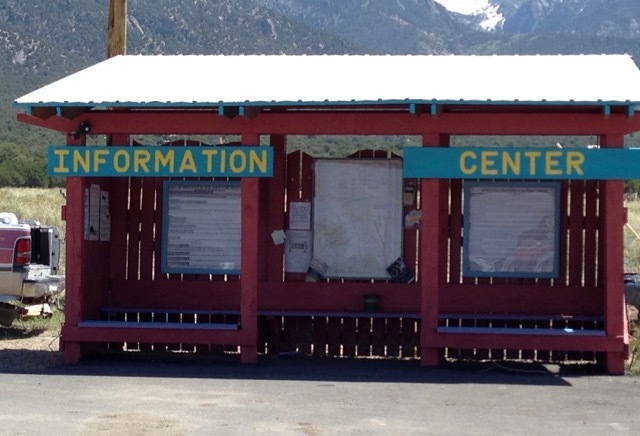 There’s a sneaks-up-on-you turn-off from highway 17, between the towns of Salida and Alamosa, onto county road T. Go east about 12 miles, and you’ll come to a three-way intersection and a kiosk labeled Information Center. You’re at the north edge of the huge land-grant given to a Spanish family, dating from Civil War days. According to trusty Wikipedia and locals I spoke with, it was originally a cattle ranching area…then gold and silver mining moved it. 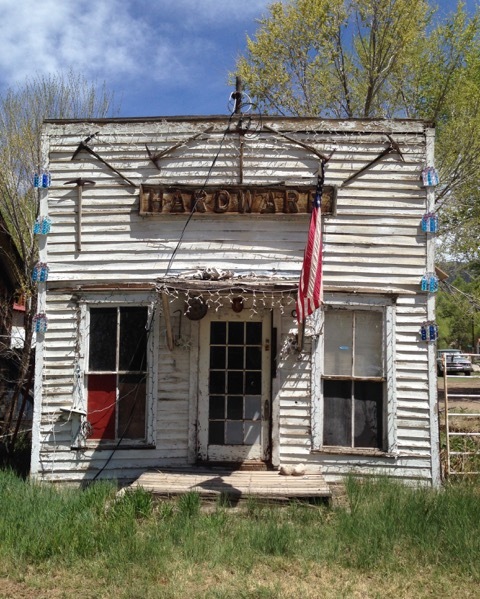 The actual Crestone town was established in 1880, and for a short time, it thrived. 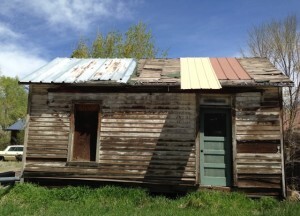 Miners’ cabins, owners’ homes, restaurants, a hardware store, and such were built. But the boom went bust; people left, houses were abandoned, wood warped, and critters moved in. 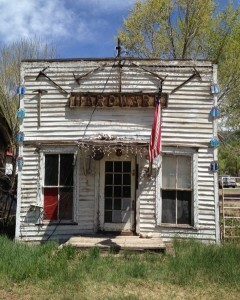 Back in gold mining days, this was Crestone’s hardware store. Note the pick-axes above the flag. A miner’s house, presumably, from the mid-1800s. It’s still in the middle of town. The population then dropped to 40, mostly retirees and cowboys. 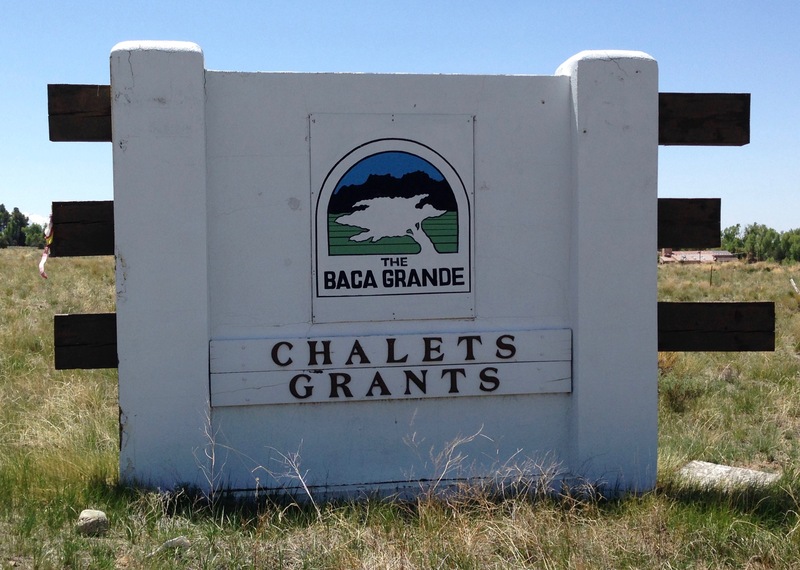 In the early 1970s a developer created a 20-sq-mile area, the Baca Grande, south of the town, laid out 10,000 lots (with underground utilities and roads), and intended to sell these lots, sight-unseen, to military retirees. Sales were slow; the project generally failed. 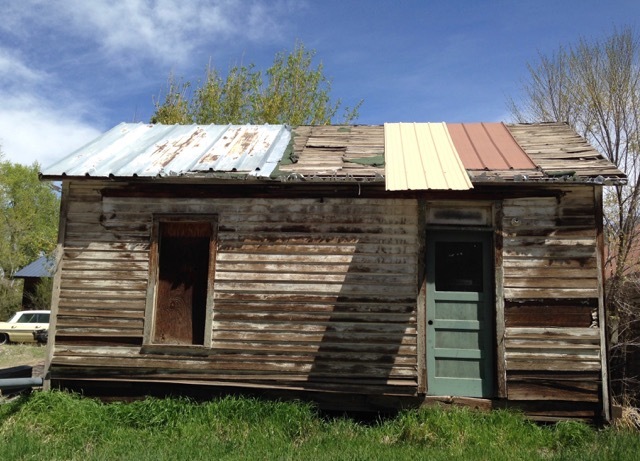 Then something extraordinary happened to this little Colorado settlement. Was it the impact of the energetic ley-lines that reputedly run under this area? Or simply the beauty, silence, spaciousness, and price of land that brought serendipity to Crestone? Now, Crestone town has several streets, one organic/homeopathic-type grocery named Elephant Cloud Market, one mercantile grocery, a small bank, a post office, an ice cream store that is about to close (according to an owner), a small cooperative artisan gallery, and more. Writers, artists, visionaries, hopefuls, hippies, marijuana growers, ne’r-do-wells, entrepreneurs, and such live here. This Buffalo by Will Bartley greets visitors entering the Baca Grande. 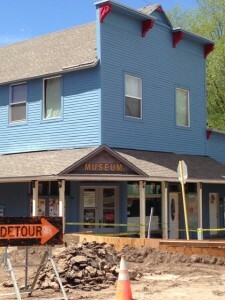 Crestone Museum is open only a few days a week. 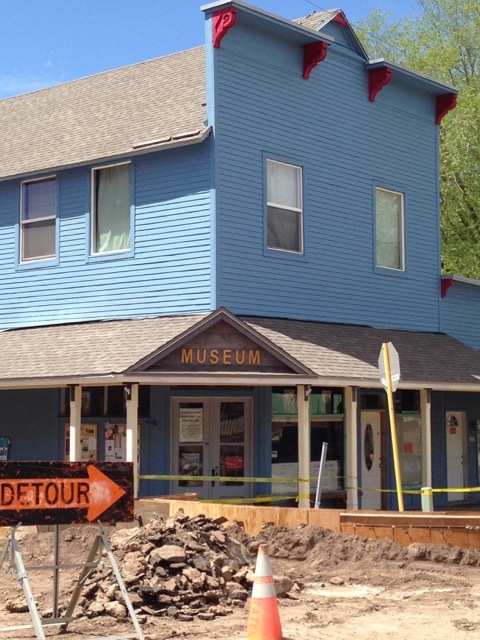 I haven’t been there yet; it’s been surrounded by construction. 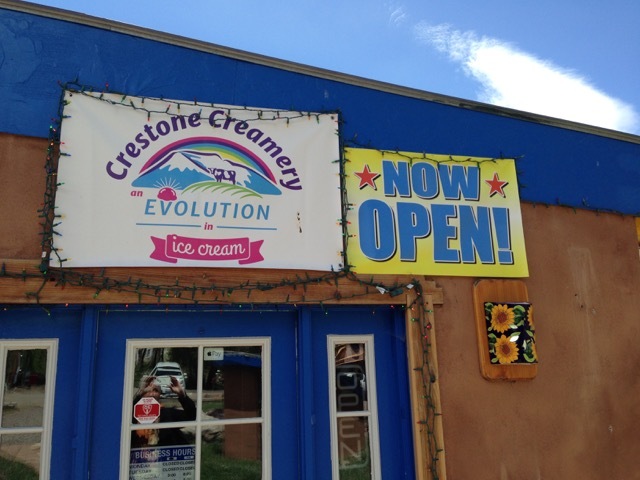 The charming Crestone Ice Cream store, which is about to close, I was told by an owner. 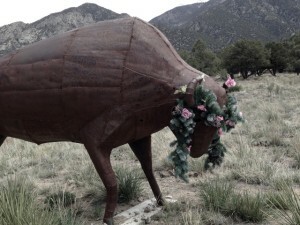 In my days here in Crestone, I’ve been taking long walks and exploring. It’s been pretty darn thrilling. In another post I hope (but I’m not promising) to write about some of the spiritual communities I visited. I’ve run across groups I’d never encountered: I guess one is never too old to not be surprised–and never too old to enjoy places of beauty.